Picturing your wedding or wedding reception at Cobb Energy Performing Arts Centre is easy to do with our dramatic, unique architecture that is perfect for photos, our one-of-a-kind ballroom, fine cuisine and personal and attentive service. We would be delighted to host you and your guests on the most important day of your life. We have the experience, the setting, and the service to transform your wedding day into a dream come true. We are convenient to more than 30 hotels. Cobb Energy Centre is located directly across the street from the Embassy Suites by Hilton Atlanta Galleria and 2 blocks from the Renaissance Atlanta Waverly Hotel. Visit our Where To Stay page for more nearby accommodations. 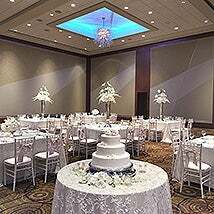 Plan the wedding of your dreams, and count on Cobb Energy Performing Arts Centre to provide world-class facilities and a friendly, professional staff offering relentless attention to detail and a make-it-happen mindset. Contact the Event Planning Department by calling 770-916-2807 or email [email protected]. The Cobb Energy Centre is Atlanta’s destination for conventions, meetings, special events, and celebrations.